Gone are the days when a collector could purchase the first printed newsstand edition of a comic and have the most collectable copy of the comic. Newsstand copies are found in stores like Barns & Noble or in grocery stores. Collectors now have a new option which is to buy copies with variant covers. Variants like newsstand are simply additional editions. These additional variant copies are now flooding the market and are increasing in value. High grade newsstand copies still retain a high collectable value, because mint versions are very hard to obtain. The stock boy/girl will stuffed them on the shelf without care, so you will need to search for near mint copies. Getting a low grade copy of a current comic is for reading, not collecting. 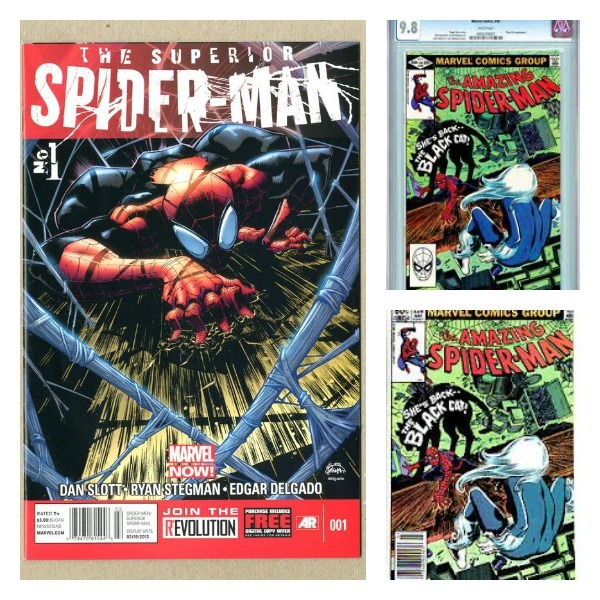 Variant copies are valued solely on mintage. These editions are well taken care of by the sellers and all come off the shelf in mint condition. Some are black and white and have a high price tag. Only the publisher knows which variant is the one to collect. The distributor may receive one variant copy with each order, so you know it will not sell at cover price. I say stick with the newsstand copy. In order to determine if you have a newsstand copy, the only visible difference is on the UPC it will have "Newsstand" printed. If you see "Direct Sales" near the UPC, then you know it is not the newsstand version. For Marvel, in the 70s and 80s, the newsstand copy was the one with a UPC instead of a black and white picture. Comics, shop wisely and shop around. I'm so glad I'm just a reader not a collector. So as long as the copy I get is in good condition I'm not overly concerned. I guess maybe I should be since I tend to keep them all and in good condition. Maybe my kids could sell them one day when I'm dead and gone LOL.